Granit. Ein Gin wie Bayern. Alte Hausbrennerei Penninger is the leading distiller of traditional Bavarian speciality spirits. Utilising over 100 years of experience and using the Bavarian Forest's native roots and herbs we created GRANIT Bavarian Gin. It combines the distillery's traditional skills with the modern-day international market for spirits. Classic gin spices and herbs including lemon, coriander and cardamom are combined with plants native to the Bavarian Forest (such as melissa, bald-money and the gentian root) to give GRANIT its distinctive taste. 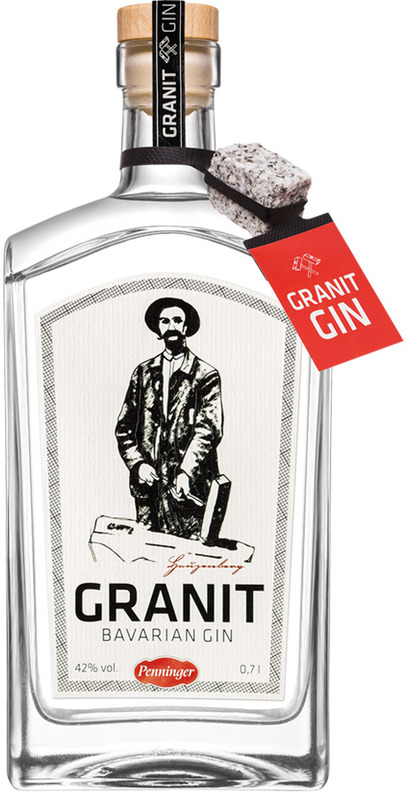 GRANIT Bavarian Gin is matured for several months in traditional earthenware vats before being filtered through granite stones of varying sizes. For this we utilise the so-called „Oxy-Esterator“. This originates from the 1960s and has taken pride of place in the Penninger Bavarian Schnaps Museum for over 20 years. This masterpiece of German engineering has been fully restored and filled with hand-cut granite stones. The granite used in the distilling process come from the historic granite cutter's town Hauzenberg, deep in the Bavarian Forest. This inspired us to name the gin GRANIT in honour of our use of local techniques and traditions. Every bottle of GRANIT comes with one of these granite stones attached. This can be placed in the freezer to cool down and be used as an ice cube. This prevents the drink from becoming watered down and is guaranteed to be a conversation starter! High quality, a unique presentation and a very good, traditional and mild taste distinguish this really great product. Great idea, perfect look. The bottle design and feel is really awesome! It looks so heritage and masculine, bavarian, craftsmanship. It’s a traditional, classic interpretation, not playful, and appears in taste as well as in design robust and deeply rooted to the region. Click a flag to order GRANIT Bavarian Gin in your country. Find news on Facebook and Instagram. We use Adobe Typekit for the visual design of our website. Typekit is a service provided by Adobe Systems Software Ireland Ltd. which offers us access to a library of fonts. To integrate the fonts we use, your browser must connect to an Adobe server in the United States and download the font required for our website. As part of this, Adobe receives the information that our website was opened by your IP address. You can get more information on Adobe Typekit in Adobe’s privacy information which you can view here: www.adobe.com/privacy/typekit.html . If you have any questions about data protection, please contact us by e-mail: datenschutz@penninger.de or telephone: +49(0)8586 9611-0.